Have you been feeling hopeless,Have you lost interest in things that you usually enjoy doing?, Are you struggling to make decisions, and dragging yourself out of bed every morning? We attribute these behaviours to depression,. 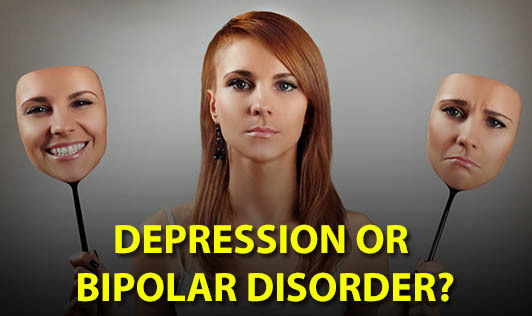 But these can also be signs of some other mood disorder such as bipolar disorder The signs & symptoms for bipolar disorder overlap and hence it is often mistaken for depression. Depression: It is expressed as persistent low feelings (for more than 14 days), such as feeling sad, hopeless, worthless, insomnia and a disinterest in life and activities around. Bipolar disorder: It is expressed as persistent cycling of moods, from high (mania) to low (depression) and vice versa. Nearly 3% of adults suffer from some form of bipolar disorder. Individuals from all all races, ages, and ethnic groups can be affected.. It can affect equal number of men and women. The condition tends to develop in late adolescence or early adulthood. For some people, symptoms may appear during childhood. If you think you have observed these symptoms in you, you may be the onset of bipolar disorder , so please consult your doctor. It's not clear what causes bipolar disorder to occur It may be a combination of genetics, environment, and abnormalities in areas of the brain. Even the most severe bipolar disorder can be treated, and people can live life to the fullest and have productive lives, with good enjoyment despite the condition.